Bibliographic entry Watt, M. (2006). Augustine. Toronto, ON: Kids Can Press. 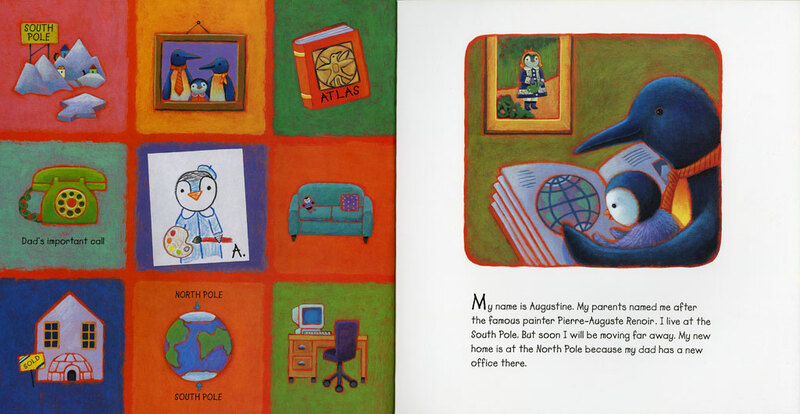 Description Augustine, a young penguin from the South Pole, moves with her family to the North Pole. She overcomes the initial awkward feelings of loneliness through her art. Her drawings help her connect to her new school community. Reaction Filled with art from Renoir to Matisse, the story emphasizes how artistic expression can be used to communicate ideas and feelings. The story would be useful in the classroom where any new beginning is happening. Miscellaneous Melanie Watt’s quirkiness is starting to emerge in Augustine. This leads to her hit books Scaredy Squirrel and Chester. Posted on September 16, 2012 September 22, 2012 by banana29Posted in UncategorizedTagged Augustine, Canadian, children's literature, Melanie Watt.